Hello world! Iceland is raw, wild, and beautifully diverse. Anywhere and everywhere you look, you’ll see vast open space, rolling green hills, tundras, steamy, sulfur rich earth, rainbows, and waterfalls. However, with a population of only 330,000 to accommodate 1.3 million tourists (2015), it is quickly developing and changing. We feel a sense of urgency to visit before it turns into the next over developed Yosemite, overrun by tourists, and where you have to pay for permits to see or do anything. =*( But first things first, we’ll dive into the details of how to plan and prepare for Iceland. Waterfall, #54,382,355. There are a LOT of waterfalls in Iceland! 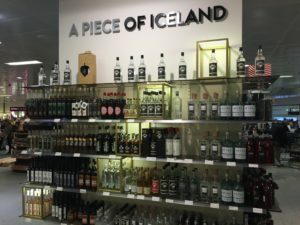 When should I go to Iceland? Iceland is pretty bizarre because from mid-May to mid-August, there is almost 21 hours of sunlight! Really trippy, but useful because you can visit most sites any time of the day/night. During the winter months, you’ll get a chance to see the Northern Lights and go ice cave hiking, something we’d like to return to Iceland to check out. During the winter, parts of the Ring Road may be closed. If your intent is to road trip around the country via the Ring Road, late spring through early fall are your best bets. 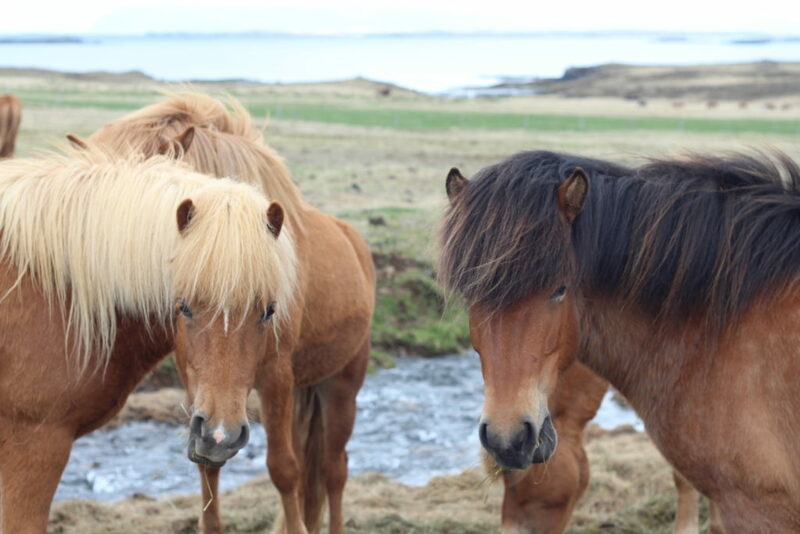 Quit horsing around and visit Iceland! BTW as of 2017, WOW airlines has some ridiculous deals, like <$200 USD roundtrip from SFO to KEF! Unbeknownst to us, the Blue Lagoon maxes out at capacity fairly quickly. Buy your tickets in advance online! We were there and almost didn’t get to go in because it was sold out, but shelled out for the luxury package to get a spot. 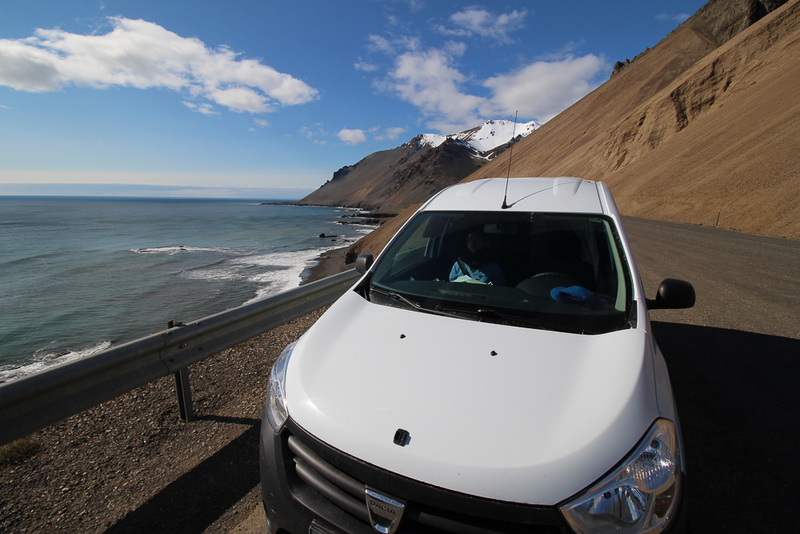 There are several transportation options to make your way around Iceland. We saw plenty of people in standard rental cars, rental 4×4 trucks, tour buses, a few motorcycles, and even bearded hippies on bicycles (they looked pretty miserable cycling against the strong Iceland winds). One adventurous option is the camper van (like a literal mini-van where you sleep at night), which is what we decided on and enjoyed (almost) every minute of! 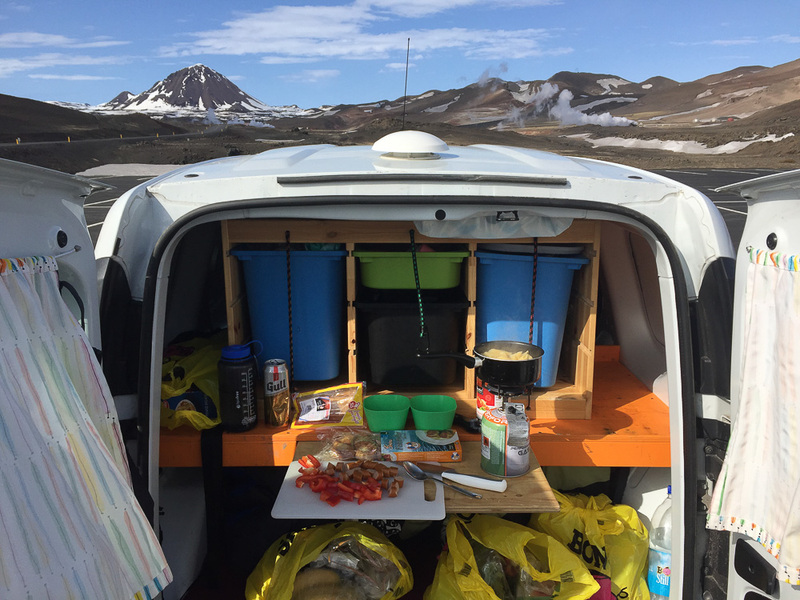 What is it like to drive a Camper Van around Iceland’s Ring Road? The most popular camper van companies are: Go Campers, Kuku Campers, Camp Easy, Rent.IS, Happy Campers. 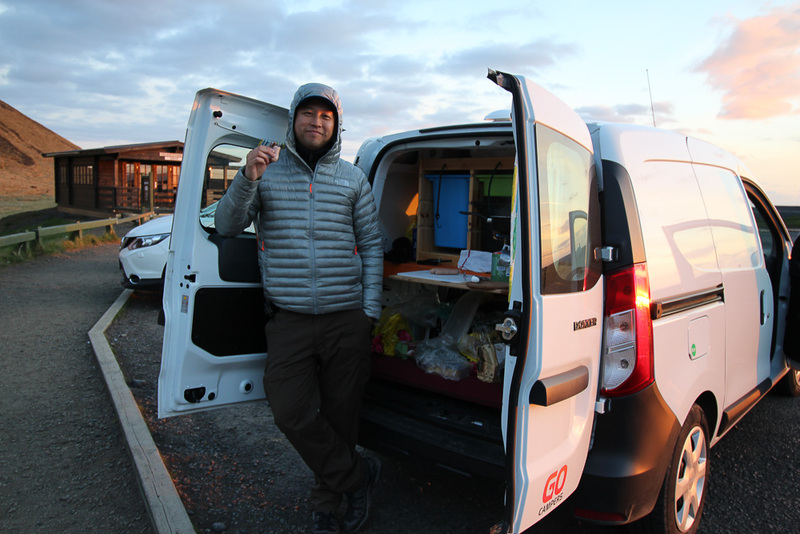 We chose Go Campers, since we liked the unlimited mileage, affordable price, and no obnoxious graphics on the van. We decided upon the 2 PAX (person) “Go Cheap” van and ended up paying $1036 USD for 10 days. Keep in mind most Icelandic cars are manual (stick-shift) so if you want an automatic, book quickly as those sell out fast and cost a bit more. There is one thing you should know before renting a camper van in Iceland, which few people on the internet seem to acknowledge. You are expected to park your camper at an official campsite! Contrary to what many of the internet bloggers romanticize about, it was very difficult to find a secluded parking space, magical cave, under a waterfall, or spot on the beach to park. 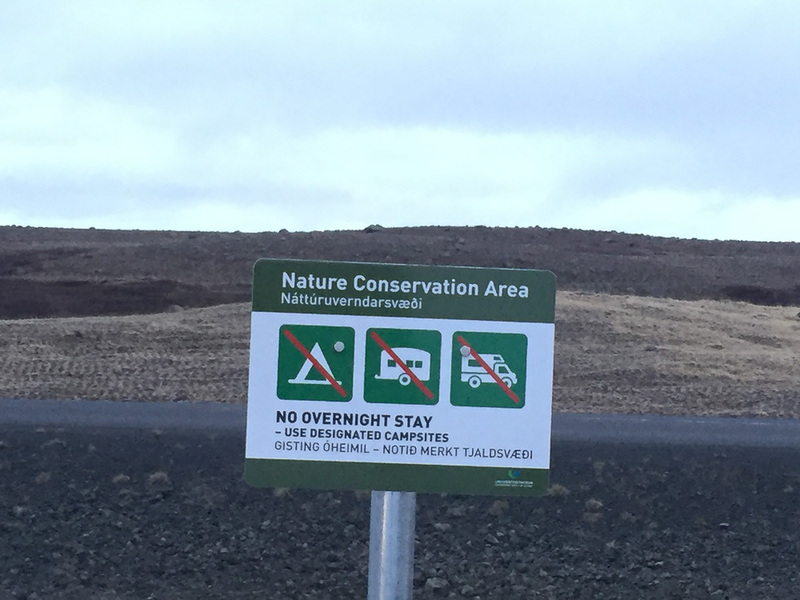 Every conceivable inch of Iceland has “NO CAMPING” signs posted. The locals have caught onto the camper van craze. Most of the land along the Ring Road (the main road around Iceland) is private and fenced off. Expect to pay ~$30 USD every night for a spot at a camp site. 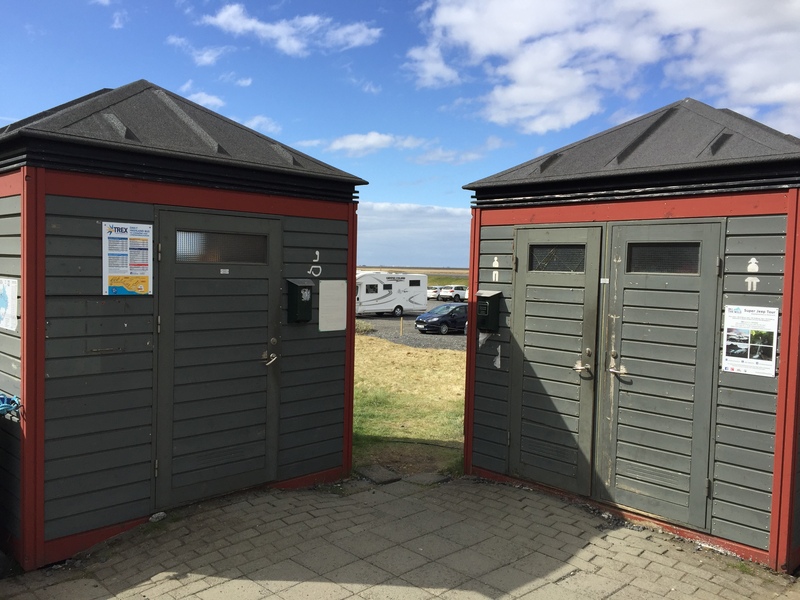 During our first few nights in Iceland, we experienced minor anxiety trying to find a spot where no park warden or local farmer would fine bother us. We ended up giving in, and staying in designated camp sites. Note: Icelandic camp sites do not have a large online presence so they can be hard to find (most not on Google maps either). Pick up a brochure with a listing of campsites and bring your Lonely Planet, which lists several in each town. It’s a lifesaver. 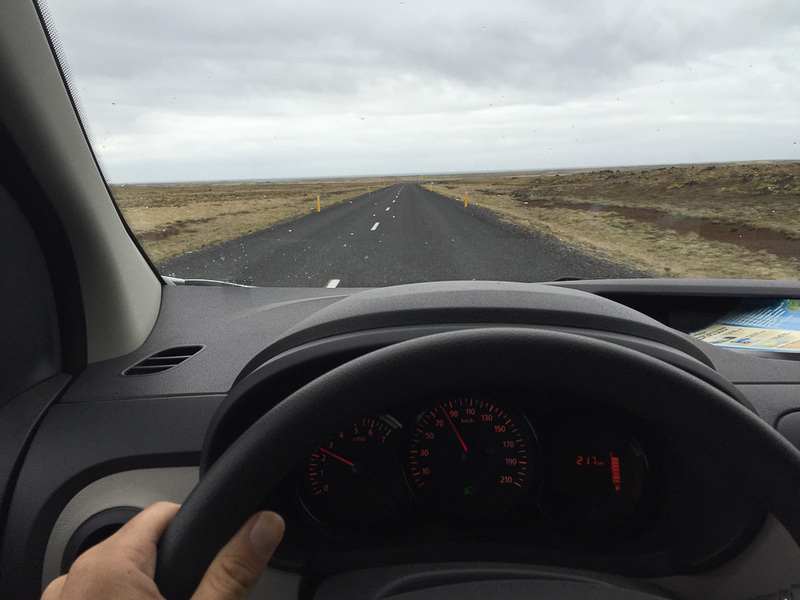 Should I buy extra insurance when renting a car in Iceland? The big question is, do you buy the extra insurance? Only you can decide, but we used our CITI Forward card, which is ‘supposed’ to have CDW insurance. We called the credit card company multiple times, but we are still not confident about the coverage, so proceed at your own risk. Anyway, we then told Go Campers we wanted to opt out of the CDW Coverage. 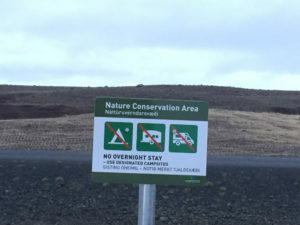 So we did not get this coverage, nor the “gravel and sand protection.” We lucked out and didn’t have any issues, but a friend who was there at the same time had to pay $1000 USD out of pocket because the fierce Icelandic winds broke his door when he opened it! Note 1: No insurance option covers wind damage to doors. Note 2: (as of 2016): Chase Sapphire, State Farm, American Express, Amex SPG, do NOT cover CAMPER VANS. Note the mileage, and reset the trip odometer. 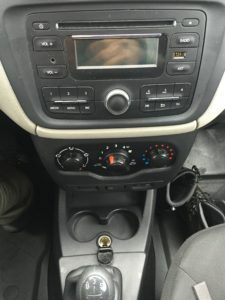 Our car was a manual transmission Dacia Dokker, a cheap version of the Renault Kangaroo, cousin of the Ford Transit. Reminiscent of the small Google delivery vans we have in San Francisco. Very flimsy, but economical with a bulletproof engine (ours had 38k kilometers on the clock). We chose the newer 2015 model. We also rented sleeping bags from Go Campers, but their sleeping bags were generic Chinese brands that were pretty thrashed. Yay, Jon’s came with a non functioning zipper. We had to drive 1 hour back to Reykjavík from the Golden Circle just to get another sleeping bag. We found sleeping bag rentals at Iceland Camping Supplies ICS. They charged us $75 USD for synthetic, and $130 USD for down. Both were Coleman brand. 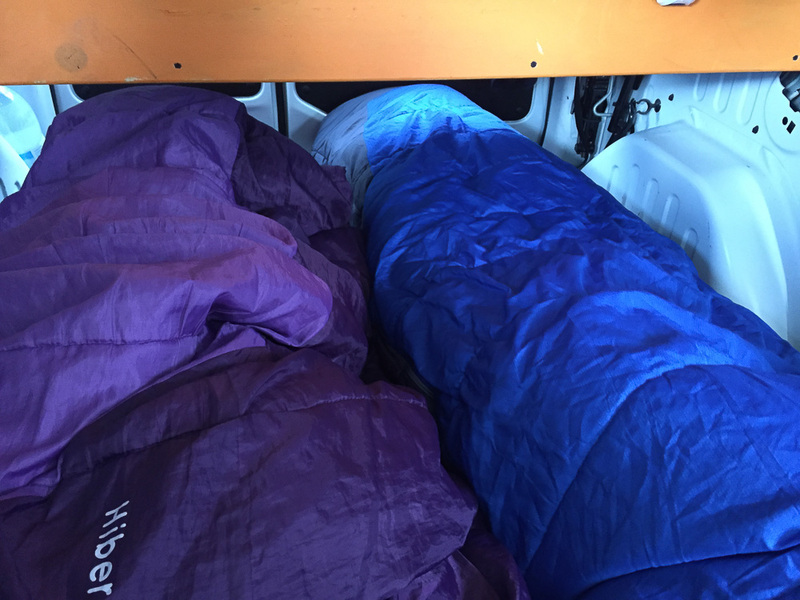 Might be worthwhile to bring your own lightweight sleeping bag if you have space (link to our Gear We Love). Camping stove burner and Lighter (Extra fuel is 15000 isk, but you can return it for credit if they are unused). We didn’t rent a cooler, since in May it was cold enough to keep everything intact for days, including yogurt and eggs. Be sure the spare tire is intact and you know how to fix a flat. Is a night time heater necessary in Iceland? Since the only model of car that had a heater for sleeping was the Go Lite (an additional 50 euros per DAY), we decided to skip this. We went mid-May and we survived (barely) some chilly nights by layering. If you’re going in the summer, June – September, you probably don’t need a heater. Any other month, yes, get one or you will turn into a popsicle. 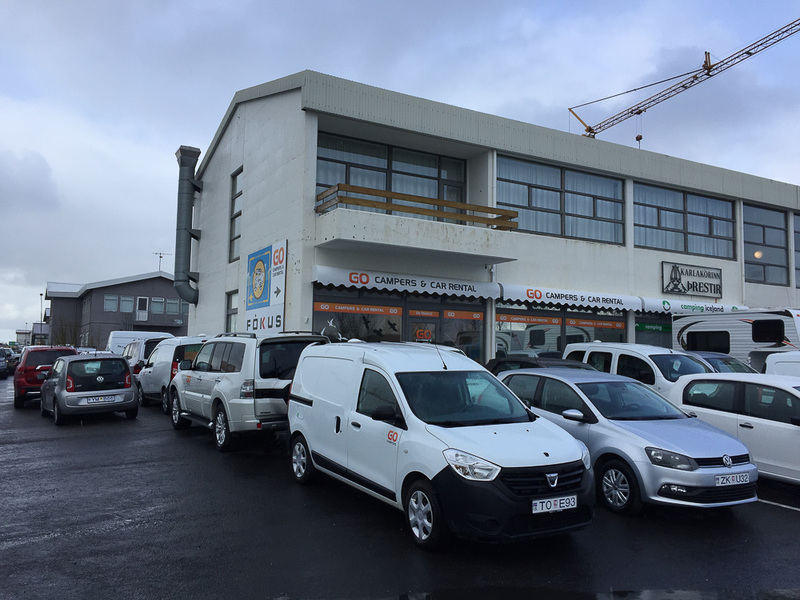 Do you need a 4×4 in Iceland? Since we didn’t have a 4×4, we couldn’t travel to the highlands, Westfjords, or roads marked “F-Road”, but we didn’t have much time for that anyway. The advantage of a 4×4 camper is the ability to drive behind a remote hill to sleep and not be bothered. I don’t think you need 4×4 if you just want to see the main sites. 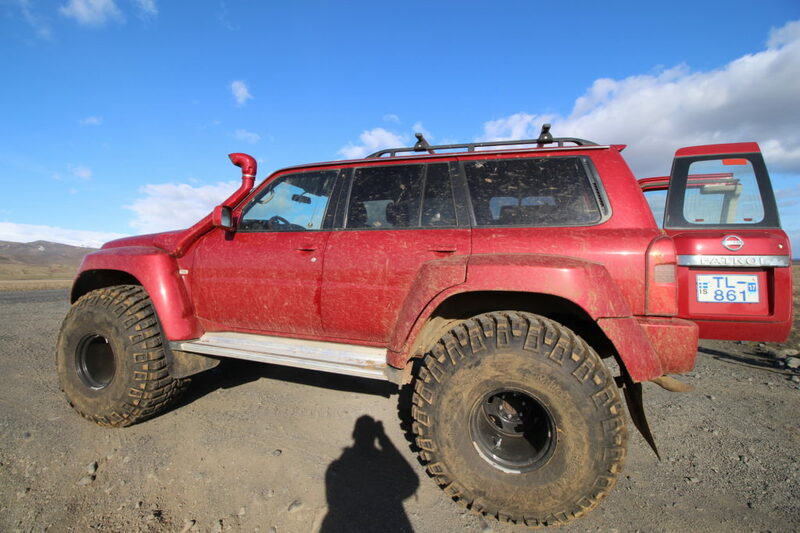 4x4s are super cool though and make you look boss. What is the speed limit on the Ring Road in Iceland? Most of the Ring Road is listed at 90km/hour. There are many signs which warn of speeding cameras, but I only noticed the actual cameras nearby Reykjavík. Not even sure they work. How do you fill up on gas in Iceland? Are there mechanics around the Ring Road? The most popular and nicest gas station is N1. Other brands are Olis, AQ, and Shell. N1 stations are quite luxurious. The big ones have a restaurant inside and large multi-stall bathrooms. Unlike America, the bathrooms are well maintained, heated, and free for use. Though in most of the country, the water smells like rotten eggs (sulfur), but completely safe for drinking. Rule of thumb, start looking for a gas station once your meter hits 50%. We had two issues with fuel. First, our gas gauge broke halfway through our trip! I did not know how much gas was in the tank, which was pretty nerve racking. Second, some gas stations are not manned. This will require you to have a credit card with a PIN CODE. Most American credit cards, such as the Chase Sapphire, and Amex will not give you a PIN CODE! Good grief. What you can do is try your debit card with 4 digit pin (you’ll probably be charged a foreign transaction fee), or buy a pre-paid gas card at the gas station during the day (denominations of 5k, 10k, 15k ISD). This made me feel a bit more secure. 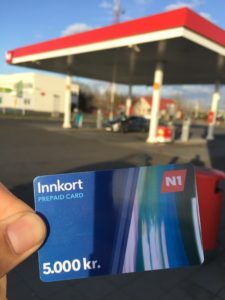 You can use these pre-paid cards to buy gas, and delicious Icelandic snacks, like hardfiskur, in the gas station. Go Campers had mechanic contacts all around island, and I’m sure all the other rental car companies do as well. Our car had an issue with the gas tank, so we stopped at a mechanic in the city of Stykkish for a check up. 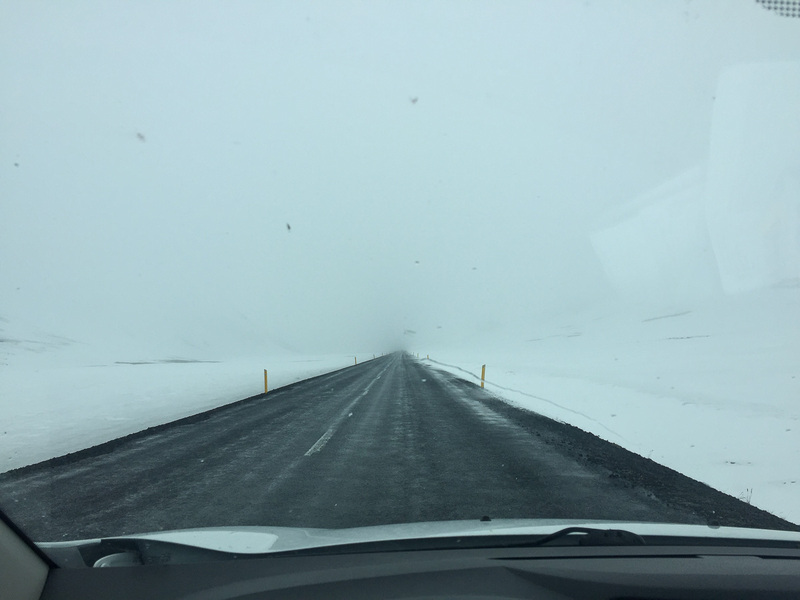 Route 1, aka the Ring Road, is a giant highway loop around Iceland. This is the primary road you will drive on. It’s easy, well paved, safe, and you likely won’t get lost. With all the stops, you will want to spend ~7 to 10 days for a road trip around Iceland. 7 seems a bit rushed IMHO, and we found 10 to be just enough. 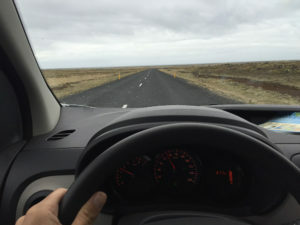 Should I drive Clockwise or Counter-clockwise around the Ring Road in Iceland? 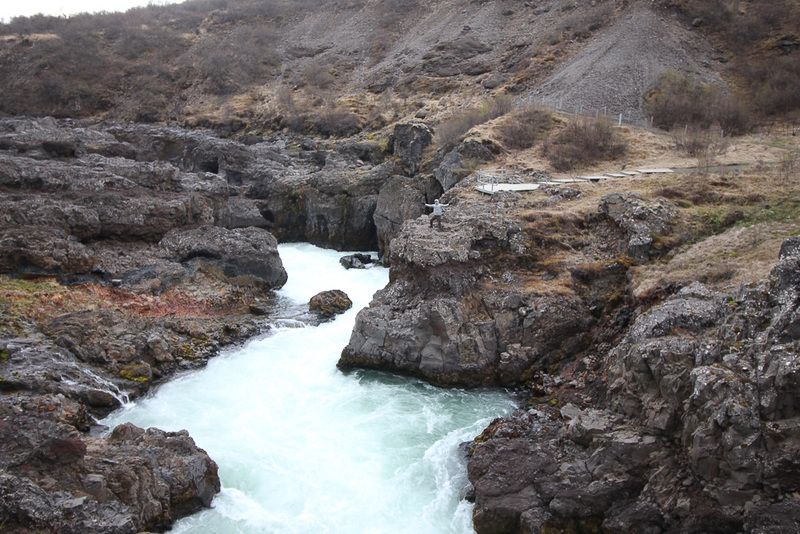 We opted to go for the counter-clockwise route, visiting the Golden Circle first. It was a great decision because there were so many things to do and see at the beginning part of our road trip. We would have been too pooped if we had gone clockwise. You’ll be fine either way, and it also depends on the weather conditions and schedule of the Northern Lights. Timing of the camper van pick-up requires special consideration as most camper rental companies are far from the airport. 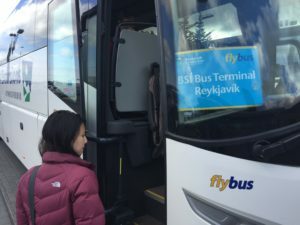 We arrived at KEF at 10:30am, and weren’t sure whether to pick up the camper immediately or explore downtown Reykjavík. We decided on the latter and took the flybus to the BSI station. Then a smaller van took us to the Radisson Blu 1919 hotel. We temporarily stowed our luggage at the front desk, but you can also store your luggage at the BSI bus terminal luggage lockers. What is grocery shopping like in Iceland? 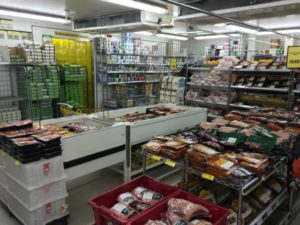 Stock up on your basic necessities in Reykjavík, as there is the most variety and prices are a bit lower. Go shopping at local supermarkets called Bonus or Kronan, near Go Campers HQ. Bonus closes at 6:30pm, but Kronan closes at 8pm (better stuff in our opinion). We purchased way too much toilet paper (toilets were plentiful around Iceland and well stocked with toilet paper) and paper towels. Luckily, Bonus allows returns, but only at the location where purchased. Also, do not go overboard on hot dogs! 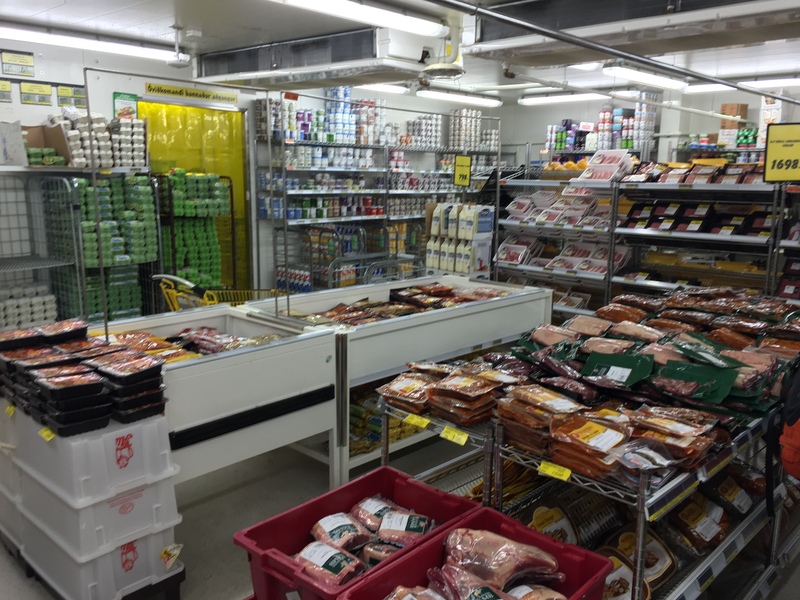 There are plenty of delicious things to eat in Iceland. For whatever reason, many bloggers advise to stock up on hot dogs. 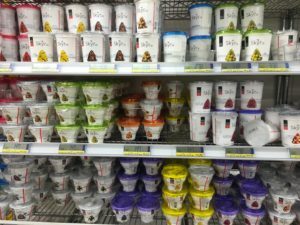 We found there to be plenty of Netto markets and convenience stores along the way, so don’t freak out and buy too much. Plus, there are quite a few amazing restaurants to try along the way (highly recommend you do this, see our day-to-day itinerary for restaurant names). 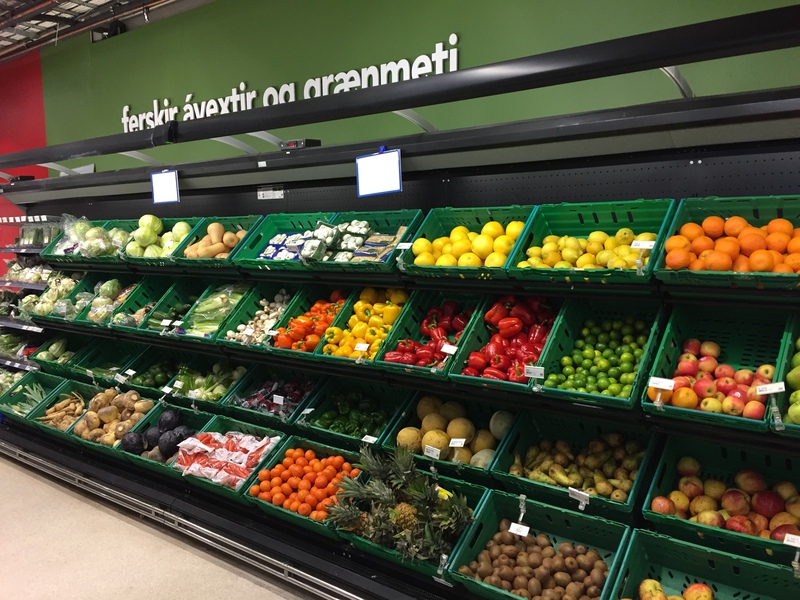 Note: Iceland has a very sad selection of vegetables and fruits (coming from spoiled Californians). 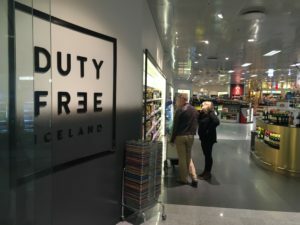 If you would like to drink alcohol during the trip, I suggest you stop at the Duty free shop before leaving the Reykjavík Airport (everyone must pass through this shop upon leaving the airport). Buy some local beers such as Viking, Gull, Einstock, or Vatnajokull (I dunno if they have this specialty one). 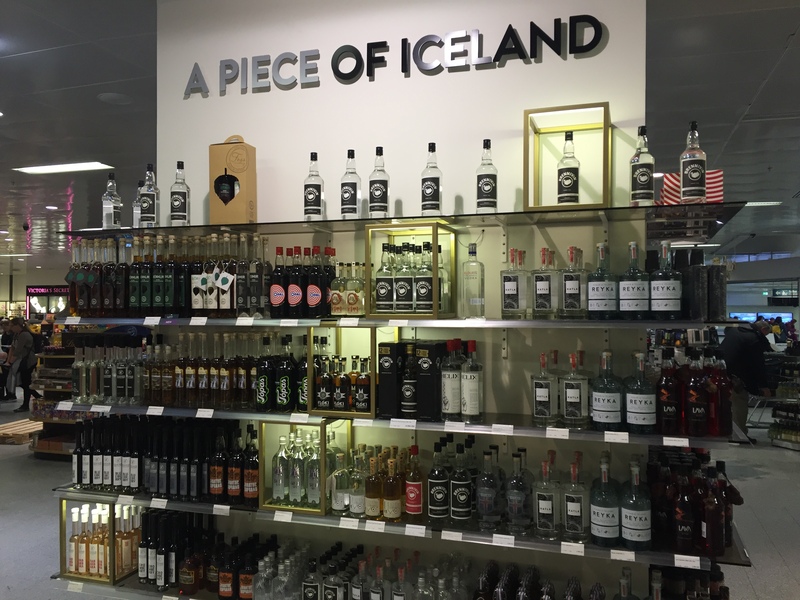 Iceland makes great vodka and gin as well. If you run out, every major town has a “Vinbudin,” the local alcohol store, but they’re quite expensive. Don’t expect to find any alcohol at supermarkets, except for watered down 2.5% beers. Yech. 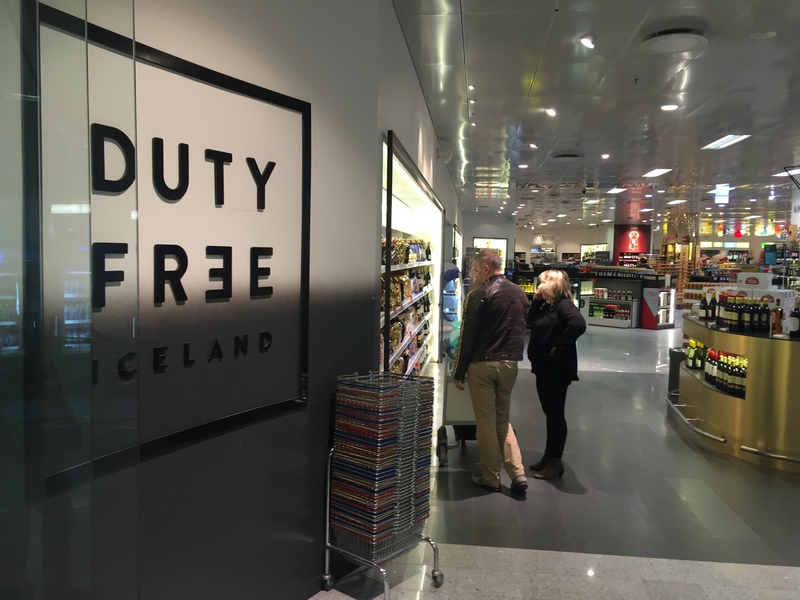 What do I pack for a trip to Iceland? Our philosophy is to pack light, since we always have to be mobile. Another consideration is the cost of check-in luggage on low-fare carriers such as WOW. Down jackets are your best friend, along with a light rainproof jacket (ie North Face Venture, Apex). Rain jackets are a must as you literally never know when it will start pouring out of the blue. Umbrellas are fairly useless because of wind speeds. Also, we lived in our hiking boots (ours were waterproof and we recommend you invest in the same), as does everyone else in the country. Note: There are coin operated washing machines at some campsites, so don’t pack too much clothing! We’ll make a list of our favorite travel gear in the future. Layer your clothing. Start with a Wool or silk base layer. 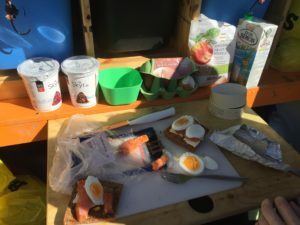 Cash – we stopped at an ATM to get 23.000ISK ($200 USD), but we didn’t really need to. We used Credit Cards everywhere. No tipping: No need to tip, unless you are buying drinks or really like the service. You can also round up on the bill. Get your VAT Tax refund at the airport on purchases over 6000 ISK, you baller. How do I use the bathroom around the Ring Road, Iceland? Every major site has modern bathrooms that are clean, heated, and Western-style. A few were pay for use toilets. Also for #1, just stop on the side of the road, it’s not a problem, except for the wind. Note: Do not pee into the wind. 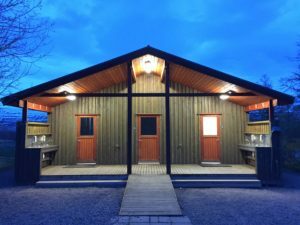 Almost every campsite has good bathroom facilities. Showers and Laundry are typically available at extra cost. Bravo, Iceland, for having plentiful bathrooms! We reiterate, Book your time at the Blue Lagoon or risk it being sold out! Technology Fail. Before you go, map out each day of your journey. However, don’t depend on your saved Google maps to work (Ours didn’t!). Good thing we printed it out. Standard Google maps worked everywhere, so we had to plot in our destination each time. Map – Good for reference, but we didn’t use it often. Phone: Call your cell phone company to activate the international plan, or bring an unlocked phone and buy a sim card. There is cell reception all around the Ring Road. Everything closes early. Like really early for a country that has nearly 24 hrs of daylight in the summer. “Naked” Showers are not a big deal. They will make you strip to take a shower before entering the public pools. 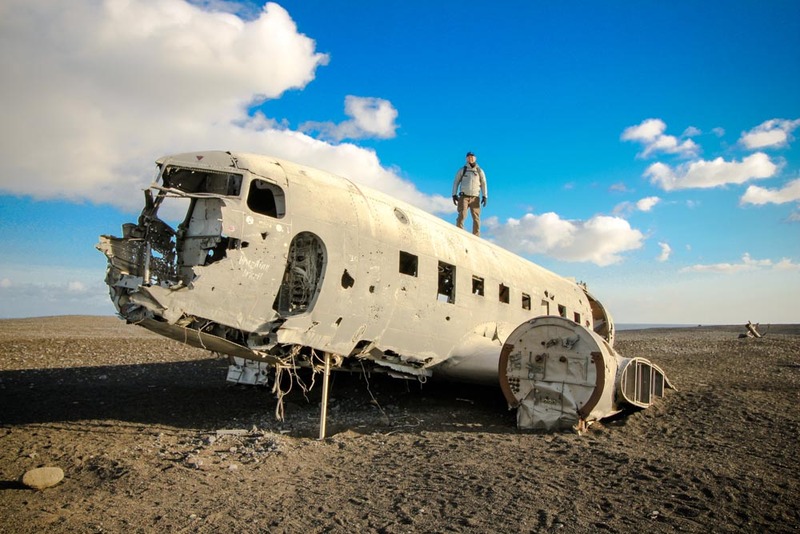 Test out your gear, ie sleeping bags, jackets, stove, BEFORE you leave Reykjavík. Every major town has a swimming pool with nice amenities, some with water slides! Water in parts of the country taste and smell like sulfur. Seemingly safe to drink. Just stinky. Herbs are delicious here, like dill. I had a strange sickness after the trip. Some stomach issues, and a low grade cold/fever for a week. A friend who visited Iceland had similar issues. 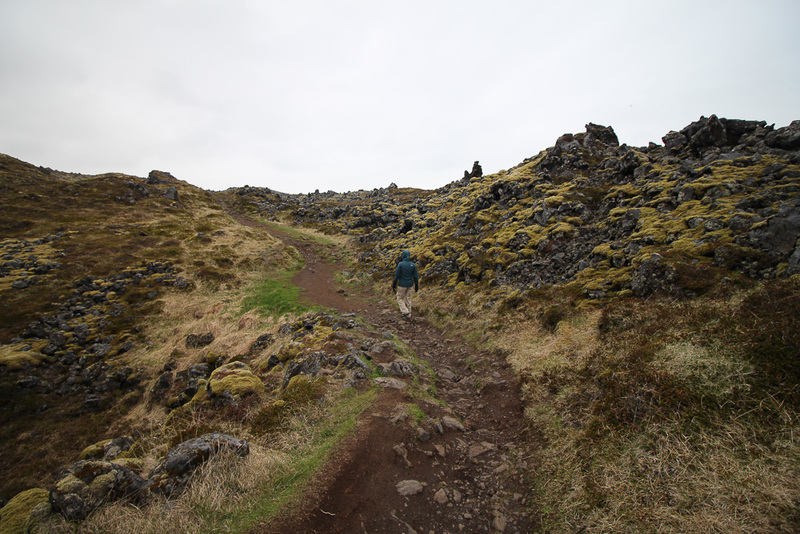 Hiking around Hellnar, Iceland, so beautiful! Iceland is easy peasy, compared with traveling to other countries. Buy your plane ticket already! And that is all we have to say about that. 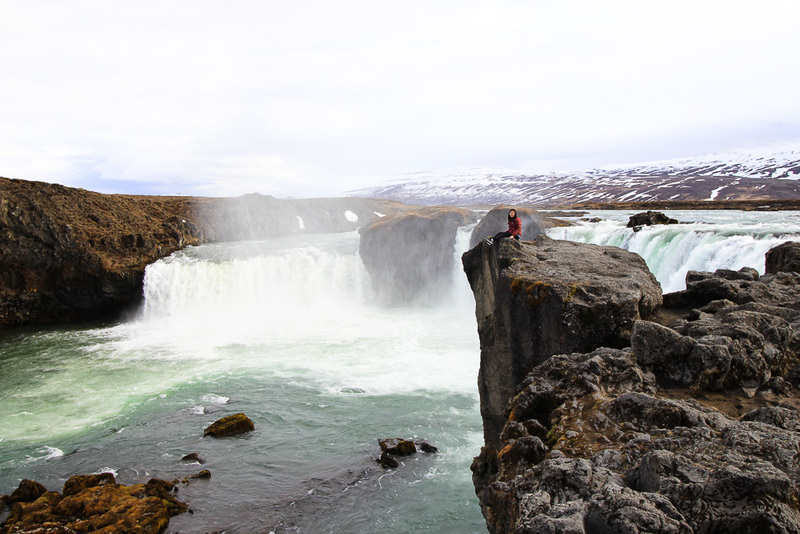 Now, on to our next article, our day to day itinerary and adventures in Iceland! Brrr, It’s kinda cold sleeping in a camper van!